Lair of the Udyrfrykte is a small ice cave on the eastern shore of Lake Fjalding in the Felsaad Coast region. The cave is part of the Mead Hall Massacre quest. 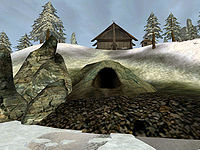 You can only enter the cave if you've finished The Skaal Test of Wisdom quest, otherwise, its entrance is blocked by snow. Inside, you'll find the Udyrfrykte, a beast that looks like a gorilla wearing a mask, who has killed the chieftain of Thirsk and most of its clan members. On its body you'll find a Severed Nord Leg (blunt weapon) and the Heart of the Udyrfrykte. This page was last modified on 25 February 2018, at 11:32.